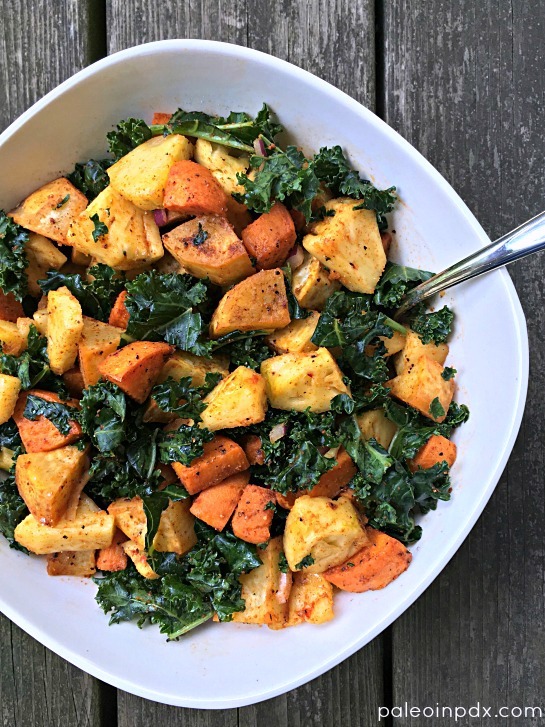 This smoky sweet potato, kale and pineapple salad is a delicious medley of sweet, mesquite and spicy, and has a variety of textures too. It’s a perfect side dish to share at a Memorial Day barbecue or other gathering this summer. I recommend making this salad ahead of time, so it can marinate in the fridge for a few hours before eating. The salad becomes much more flavorful, although it’s still good if you don’t have time for that…or aren’t patient. I really enjoy this side dish with chicken, but think it would pair well with nearly any protein. Meanwhile, you can catch me making this recipe on KATU Afternoon Live on Friday, May 26! Watch the replay of my segment HERE. Spread sweet potatoes onto a large baking sheet and drizzle with melted coconut oil. Mix in the minced garlic, 1 Tbsp of the mesquite seasoning, and sea salt and black pepper, to taste. Place in preheated oven and roast for 30-35 minutes, stirring halfway through. Once done, set aside to cool completely. Add the kale to a large bowl and generously season with sea salt. Massage the sea salt into the kale with your hands for 1-2 minutes (this helps the kale soften and makes it more flavorful). Then, add the olive oil, red onion, pineapple, and remaining 1 tsp of mesquite seasoning. Stir well. 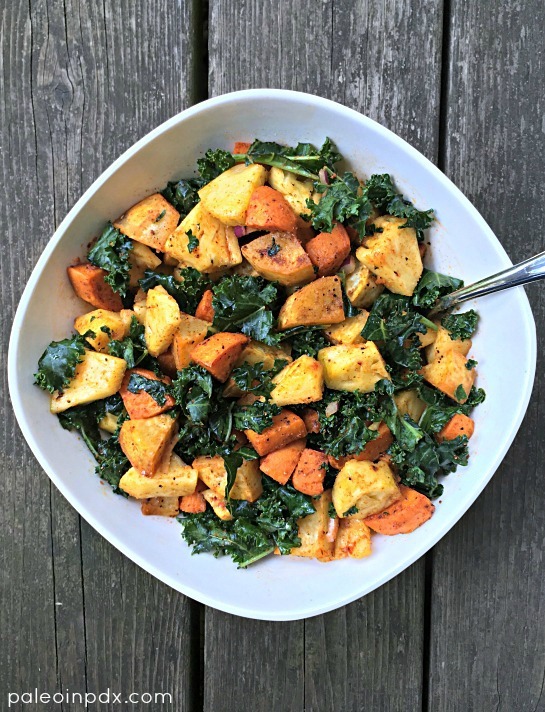 Once sweet potatoes have cooled, add to the kale mixture and gently stir. Taste and add more mesquite seasoning, sea salt, black pepper or olive oil, if desired. If possible, allow flavors to marinate in the fridge for at least a couple hours before serving. When ready to serve, I recommend sprinkling on a dash more mesquite seasoning, but this is optional. This looks really good! I live in Salem so its always fun to randomly find other Oregonians! Thank you for sharing! Thanks, Jen and hello to a fellow Oregonian! Hope you enjoy the salad if you make it!